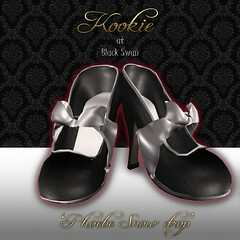 As some of you probably know by now Kookie is participating in Winter at black swan , There are a pair of exclusive shoes there for a limited time. It will not be at the store after the event is done so get there quickly before it goooes! There’s a great Sim to explore and plenty of other designers showcasing exclusive items. ~ by kookienews on December 17, 2008.